Talk about getting around! 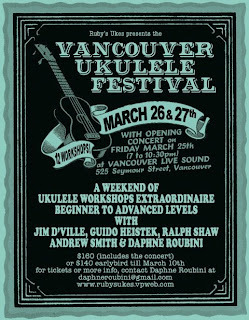 I’ll be at three ukulele festivals in three different countries in March! First off is the Melbourne Ukulele Festival in Australia, February 25-March 1. This is one wacky event hosted by the irreverent Melbourne Ukulele Kollective. Includes Australian and international performers, plus heaps of local acts from all over the country. 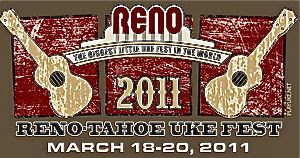 I’ll have time to grab a quick shower after returning from down-under before heading off to the biggest-little ukulele festival in the world, The Reno-Tahoe Uke Fest held at the Nugget Casino in Sparks, Nevada, March 18-20. I’ll be presenting two workshops during the weekend. 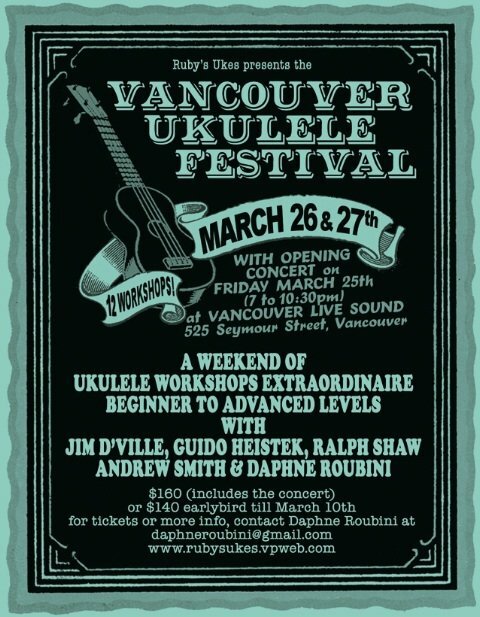 Finally, It’s north of the USA border to beautiful Vancouver, British Columbia for the 2nd Annual Vancouver Ukulele Festival hosted by Ruby’s Ukes. I’ll be joining some of Canada’s top players and instructors including Ralph Shaw and Guido Heistek. This is a small festival that is a lot of fun! Also on tap in 2011 is the West Coast Ukulele Retreat May 18-22 near Monterey, California, (early-bird registration ends this week), and Portland, Oregon workshops in early June. Watch this space for more information.